Friends and foes of President Donald Trump began rallying in the border communities of San Ysidro and Otay Mesta Tuesday morning hours ahead of his expected visit to the border wall prototypes. Chanting “build that wall” and “we love Trump,” a group of at least 100 supporters of the president and his plan to build a wall along the U.S.-Mexico border gathered Tuesday in Otay Mesa. Trump will be traveling to Otay Mesa to view the 30-foot-high prototypes after he arrives at Marine Corps Air Station Miramar at 11:30 a.m.
Trump’s official travel schedule following his arrival was not released. But upon hearing that he’ll travel by helicopter from the Miramar base to the border, organizers of Women’s March San Diego announced plans to erect a large sign urging Trump to “build bridges, not walls” with the hope that he’ll be able to see it while landing at the nearby prototype site. The largest planned anti-Trump protest is scheduled at a San Ysidro Catholic church that offers a full view of the nearby border. Scheduled to appear at Our Lady of Mount Carmel at noon are state Sen. Kevin de Leon, D-Los Angeles, Assemblywoman Lorena Gonzalez Fletcher, D-San Diego, and ACLU and labor leaders. The hundreds expected at the San Ysidro rally will also hold up California immigration policies as ones that should be emulated on a national level — the same policies that have raised the ire of the Trump administration. Trump’s visit comes after Attorney General Jeff Sessions last week sued California over three of its so-called sanctuary laws. Sessions said the laws, which restrict how local law enforcement can cooperate with federal immigration officials, are unconstitutional and undermine national security. Sessions has also threatened obstruction of justice charges against Oakland Mayor Libby Schaaf, who recently warned constituents of impending raids by Immigration and Customs Enforcement agents. Gov. Jerry Brown, a vocal Trump critic, tried to find common ground with the president. In a letter Monday, he invited Trump north to the Central Valley to tour the bridges and viaducts being built for the state’s high-speed rail line. Despite the tense relationship between Trump and the Golden State, Californians in support of the “big, beautiful wall” were prepared to come out in force to welcome the president. 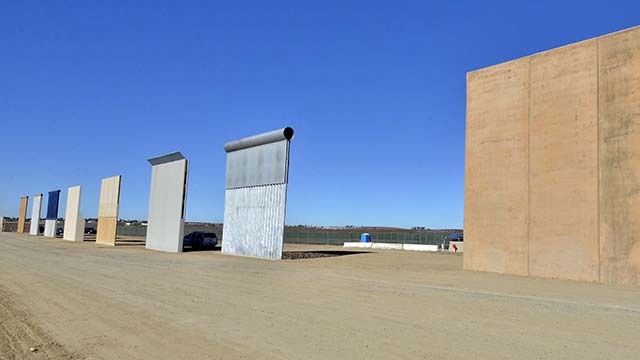 “The public has been expressing a strong desire to publicly show their overwhelming support for President Trump’s visit and his commitment to securing our border and homeland,” said Jeff Schwilk, Founder of San Diegans for Secure Borders. That group organized a rally with other conservative groups in Otay Mesa, with attendees expected to include gubernatorial candidate and Assemblyman Travis Allen, R-Huntington Beach, Assemblywoman Melissa Melendez, R- Lake Elsinore, author and documentarian Trevor Loudon, and former Assemblyman Tim Donnelly. According to the White House, Trump will speak to military personnel at Miramar at 2 p.m. before heading to the Los Angeles area for a Republican National Committee fundraiser.